Maj Sjöwall is a Swedish author and translator and is best known for a series of ten novels about Martin Beck, a police detective in Stockholm, which she wrote alongside her partner Per Wahlöö. In 1971, the fourth book in the series, The Laughing Policeman, won an Edgar Award from the Mystery Writers of America for Best Novel, the first foreign language book to do so. It was adapted into a film of the same name, starring Walter Matthau. Sjöwall met Wahlöö in 1962 and they had two children together. They were both Marxist, Per more so than Maj. Per passed away in 1975, only a few months before the final book, The Terrorist, was published. It was Per that decided that the last word of the last book would be “Marx”. 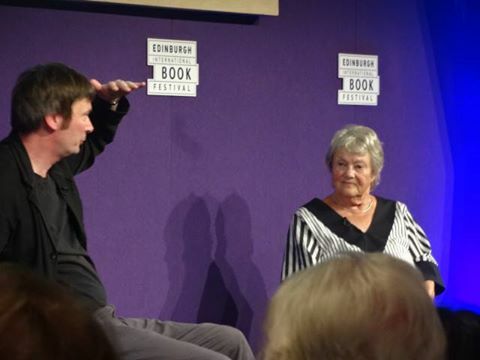 Ian Rankin was a great host for this event and invited Maj to tell the audience how it had all begun. She said that she and Per began talking about writing together in 1963, but it was whilst on a cruise that the idea about what to write about started to take root. There was an American tourist on the cruise whom Per thought was very pretty, so Maj suggested that could be the character to be killed off in the first book – Roseanna. They also decided at the beginning that if the first book was successful, they would write a book a year for the following 9 years, to give them a 10 book series. Maj then gave us an insight into how she and Per wrote the books. They lived in Malmo with their two children plus Maj’s other child from a previous relationship. They tended to write at night, once the children were in bed. They did all of the writing together, including the development of the characters (her favourite is Kollberg) and coming up with a plot for each book. They would write in longhand and take a chapter each, then swap over and type up each other’s chapter the following day, giving them an opportunity to edit each other’s work. She also talked about the challenge of developing a new writing style for the both of them, to smooth out the joins between chapters. Maj and Per have been cited by more recent successful Scandinavian authors such as Henning Mankell, as being a huge influence on their work. Maj doesn’t think she has missed out, now that everything Nordic has become the “in” thing, although she does love some of the attention. To counteract that however, she added that she only writes when she feels like it and if she has a nice idea, but she doesn’t want to be published and be part of the “circus”. This was a really interesting discussion between two authors who clearly had respect for each other’s work and left me wondering what might have been if Per had still been alive. I think the two of them would have been a force to be reckoned with – Maj certainly is.